We would love to meet you! Tours typically last 45-60 minutes. You can also schedule a meeting with our academic advisor to learn more about majors, admission requirements, and any additional questions you may have. We only provide tours for prospective deaf and hard of hearing students and their families. If you are not deaf or hard of hearing, please visit the Student Outreach and Recruitment website for scheduling a tour. Prospective tours are offered weekdays. A confirmation and reminder email will provide further tour details, including tour meeting location. 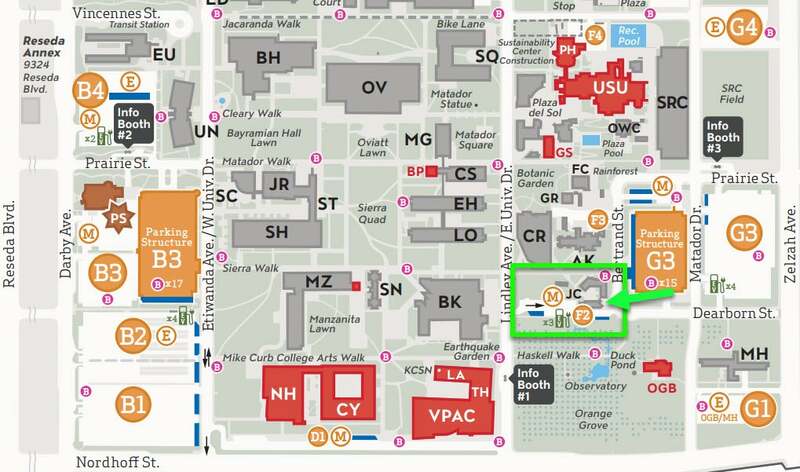 View our Campus Map. Enter G3 parking lot from Prairie Street off Zelzah Ave. Search for JC (Jeanne Chisholm) building, across from G3 parking lot. A parking pass may be purchased at any of our university parking lots. Free parking is available on Zelzah street. CSUN Application opens October 1st and closes on November 30 for Fall Semester.